But what about the price rise? FOR the first time since Independence, India is set to achieve 8 per cent growth for four consecutive years. The Prime Minister’s Economic Advisory Council has made a 7.9 per cent growth projection for 2006-07. IT was easy for Karl Marx to observe that philosophers have interpreted the world, but the point is to change it. The rub lies in the interpretation as Maoists in India are discovering about their comrades in Nepal. Union Urban Development Minister S. Jaipal Reddy’s defence of the Delhi Laws (Special Provisions) Act in the Lok Sabha on Monday may not stand the test of legal scrutiny at the end of the day. THIS year the US has approved of giving $180 billion as direct subsidies to its farmers. When we add the subsidy offered by the European Union countries to this, the figure for direct subsidies comes to a whopping $300 billion per year. MY Sunday morning slumber was disturbed by the consistent ringing of the telephone bell. An old friend was on the line. He sounded disturbed: “Please see the newspaper and explain to your bhabhi. She has gone berserk”. Independence Day is an occasion for nostalgia and rededication to the goals and values of freedom. Recallng Jawaharlal Nehru’s stirring words about a tryst with destiny brings a lump to many a throat. IN Punjab and much of north India the farming community is slowly but surely losing hope and direction in keeping agriculture alive as a means of livelihood and a respected way of life. THE suicides in the farm sector are not confined to grains and pulses alone as hundreds of workers in tea plantations have also ended their lives for non-payment of wages for years. FOR the first time since Independence, India is set to achieve 8 per cent growth for four consecutive years. The Prime Minister’s Economic Advisory Council has made a 7.9 per cent growth projection for 2006-07. The RBI’s forecast is of 7.5 to 8 per cent growth. In his Independence Day address, Prime Minister Manmohan Singh did mention proudly the fact that the country had the second highest rate of growth (after China), but he dwelt more on challenges ahead. These are essentially the rising oil prices, agricultural slowdown and “iniquitous social order” where vast segments of our people are untouched by modernisation. The Prime Minister focussed on what troubled the common man: “I know each of our families is concerned about the prices of essential commodities”. And he went on to explain how the steep hike in the global oil prices had burdened the treasury. From just over $30 a barrel two years ago, the crude oil price has risen to $75. Still the prices of kerosene and LPG have been kept unchanged. Oil marketing companies want the petrol and diesel prices to be raised by Rs 6.31 and Rs 8.25 a litre. If the oil prices are not raised by mid-August, their under-recoveries would touch Rs 15,550 crore. The PM has hinted at an increase in the prices of petrol and cooking gas, which, if effected, could lead to a general price rise. Containing inflation then would be the government’s top responsibility. On agriculture, the Prime Minister had nothing new to offer. It was more of the same: better irrigation, higher credit and more relief on rural debt. With a deficient monsoon likely in North India, the farmers’ plight may worsen. Farmers need better prices for their produce. At the same time, the public distribution system should be overhauled so that the poor are spared the brunt of the rising prices. Agricultural productivity is low and small land-holdings come in the way of competitive farming in a globalised world. The government needs to go beyond Bharat Nirman and the job guarantee scheme to make reform benefits available to the rural poor. IT was easy for Karl Marx to observe that philosophers have interpreted the world, but the point is to change it. The rub lies in the interpretation as Maoists in India are discovering about their comrades in Nepal. Unless you get the interpretation right, the way to changing the world could go wrong. Maoists in Nepal, who are engaged in negotiating their place in multiparty democracy, are under fire from Indian Maoists for joining hands with feudal and bourgeois parties like the Nepali Congress and the Communist Party of Nepal. The Maoists in India see this – abandoning of the “People’s War” — as a betrayal of the revolution. Nepal’s Maoists, far from being fazed by the attack, have reportedly turned around to say that the Indian comrades-in-arms must follow their lead, come overground, give up their arms and join the democratic process. This has made the Indian Maoists see even more red. Initially, Indian Maoists were all praise and support for their Nepali counterparts who had waged a 10-year People’s War campaign. But once the King was dethroned and a popular government – with the support of the Maoists – sworn in, the children of Naxalbari found that this was not according to their book. As if to make matters worse, the Nepali Maoist supremo Pushpa Kamal Dahal alias Prachanda criticised Stalin and invited capitalists to join hands for the economic development of Nepal. This was hard enough to stomach. Prachanda made it worse by saying that the Maoists in India must adopt the same method used in Nepal to establish (genuine) multiparty democracy. Prachanda said he had no problem joining hands with feudal and capitalist forces to ensure peace and freedom to the Nepali citizens. More galling to the Indian Maoists must be that the Maoists in a smaller country have questioned the ideological hegemony of the comrades in a bigger country. Doubtless, both Kathmandu and New Delhi will make the most of this rift. The only party happier than these two would be the CPM, which has no love lost for Indian Maoists but is only too ready to mediate between Nepali Maoists and New Delhi. Truly, there are many roads that communists can take—for effect, or otherwise. Union Urban Development Minister S. Jaipal Reddy’s defence of the Delhi Laws (Special Provisions) Act in the Lok Sabha on Monday may not stand the test of legal scrutiny at the end of the day. His claim, in a written statement, that the Supreme Court had not stayed the Act is, no doubt, true. However, while directing the re-sealing of all de-sealed shops from September 16, in its order on August 10, the Bench consisting of Chief Justice Y.K. Sabharwal, Justice C.K. Thakker and Justice P.K. Balsubramanyan pointed out that the Act was “prima facie invalid”. Maintaining that the Act “could have been stayed in its entirety”, it said that it was not ordering a blanket stay for the present as that would amount to the revival of the demolition operation, on which it had passed no orders. Specifically, the court quashed the Centre’s May 20 notification and said that the Act’s constitutional validity will be decided in its final order. What is strange in this episode is the government’s refusal to cleanse the system and the city of the mess created by blatant violation of building bylaws and commercial activities in residential colonies. The corrupt officials of the Delhi Development Authority, the Municipal Corporation and the Delhi Police have connived with builders and contractors to ensure the growth of such illegal constructions, encroachments and commercial activities. By enacting a retrospective legislation, the Delhi government and the Union Urban Development Ministry have indeed tried to find a way to right the wrong and thus make legal what is patently illegal. The only alternative left before Mr Jaipal Reddy and his team now is to scrap the flawed Act and examine the issue afresh to deal with the problem of unauthorised construction. The marvellous thing about a joke with a double meaning is that it can only mean one thing. THIS year the US has approved of giving $180 billion as direct subsidies to its farmers. When we add the subsidy offered by the European Union countries to this, the figure for direct subsidies comes to a whopping $300 billion per year. This is some 700 per cent more than the aid offered by the developed world to the developing world per year. In contrast has been the condition of our farmers. The long-suffering farmer had been an important icon in our society since the days of the freedom movement. Strong, resilient, hard working, intelligent, always giving, and never demanding, the farmer was seen as the backbone of our society. Till very recently it was believed that improving the farmers’ lot would inevitably result in an improvement in society as a whole. Many initiatives were taken by the government immediately after Independence in this regard. Land reforms were introduced. A more equitable distribution of land was tried. Research was done to improve the quality of farming. The quality of farm inputs was improved. The government even provided subsidies to the companies producing fertilizers, seeds, pesticides, farm equipment, water supply and electricity supply in the hope that the subsidies would benefit the farmer. Whether they really did or not and to what extent remain open for discussion and the answer depends on the kind of parameters on which we base our judgement. The fact was that by the late 1960s a revolution in farming was visible. Begun at the initiative of the government, the Green Revolution, as it was called, started from Ludhiana district in Punjab and rapidly spread across the entire country. By the end of the 1970s food self-sufficiency seemed a possibility and by the 1980s it had become a reality. The hard-working farmer had demonstrated that, given the right conditions, he could provide enough food to meet the growing needs of the country. But this was also the time when opinion among experts and the public had begun to veer away from state-supported enterprises that had been the hallmark of India’s economic growth since the 1950s. One of the targets of such ideological shift in economic thinking was the farmer. It began to be argued that farm produce in India was produced far too inefficiently; it was far too costly, and far too heavily subsidised. That is another matter that the direct subsidies that the farmer got in the form of free or cheap power, water, seeds, fertilizers and pesticides were available only in name and not actually. Power and water supply were notable for their absence. Without any quality control mechanism, it was not clear whether the quality of seeds, fertilizers and pesticides was as per specifications or not. Few mentioned that even this subsidy-in-name-only to the Indian farmer was peanuts as compared to the direct subsidy that was available to the farmers in Europe and the United States. Similar help has been lacking for the Indian farmer even when they continued to plod on, caught in a scissors crisis where the costs of industrial inputs into farming are sky-rocketing while the price of farm produce is unable to keep pace. It was no mystery, therefore, that even when in the eyes of the ideologues of free trade the Indian farmer was a pampered soul, actually the majority of them continued to be so poor. Indebtedness seems to have broken this farmer in the 1990s. Or at least this is what was claimed in numerous reports about the increase in suicide by farmers in the 1990s. Increasingly, through the 1990s and later, we heard with concern news of farmers across the country committing suicide. It almost seemed as if the farmer was giving up too fast. In so far as journalistic reports go, it seemed that the cotton farmers, especially in Andhra Pradesh, Maharashtra, Karnataka and Punjab, were the most susceptible. But we heard many stories of farmers’ suicide among those who were cultivating other crops like onion and wheat as well. It seemed that the farmers’ distress was quite widespread and not confined just to one or two crops. Yet, when a Situation Assessment Survey was conducted by the NSSO in 2003 (NSS 59th round), it showed that even today over 70 per cent of the farmers liked farming. Of the 27 per cent who said that they did not like farming, not more than 30 per cent thought that the cause of their dislike was the low returns in farming while less than 10 per cent who disliked farming did so because it was a risky proposition. In short, even with all the troubles associated with farming, the majority of our farmers were still willing to continue to toil. But surely, society and the government could do a little more than is already being done for the farmer to reduce the burdens. Instead, what seems to have happened is that our society has gradually drifted away from its concern for the farmer and its interest in farming. Some of this may be the result of the changes happening in society and the economy. It could also be because for a very long time now the Indian farmer has been so successful in filling the nations’ granaries that we have begun to take the farmers’ production for granted. Even when we do get concerned our solicitude for the farmer remains high on romance and low on practicalities. Moreover, there has always been this seemingly attractive but contentious proposition that there is so much food available in the markets of the world and at such cheap rates that we can always import it when needed and hence a belief that we need not be unduly concerned about the farmers’ condition in India. Few among us know that the cheap foreign grain imports are the result of direct subsidy being given by those governments. Perhaps, the time has come for us to provide direct subsidy to our farmers. “Kya ek crore ki lottery lagi hai”, I asked. I glanced through the newspaper. The headline was loud and clear about having a male child. It was nothing new for me. But putting it in such a bold headline in a newspaper was disturbing. I told my friend that this technique was used for finding genetic defects and this will be a gross misuse. I got lost in thoughts about the increasing incidents of female foeticide till my friend virtually shouted: “Kahan kho gaye”. But his wife was adamant: ”If God gives an opportunity why not make use of it”. I tried to convince her, saying: ”This is not an opportunity. A majority of people will not have pregnancy, leave aside the male baby. May be, 20 to 30 per cent will conceive and barely 5 to 10 per cent may carry home a male child. It is a gamble and a no-win scenario”. Since getting a loan was difficult, it was decided to sell the house. The property consultant, a family friend, also pleaded. But nothing could convince her. The formalities completed, the couple reached their destination — California. The doctor boosted their ego, saying they would have a rosy future with a male child. The doctor went ahead with his tests and after a few days announced that the process was a success and they could soon have a male child. But their celebration was shattered after a few days when the doctor talked about a snag and that the process had failed. “Don’t worry”, said the doctor, “we will try again. Please deposit Rs 5 lakh for the next attempt”. But that was not to be. The couple had just the return ticket and nothing else. The couple was in tears on arrival. I took them to the same property dealer. “What happened?” he asked seeing the tears in my friend’s eyes. “Na munda milya, na hee ghar rahiya. Hun to Rub mainu chuk laye”, she said. “Bhabhiji, take the key of your house. I knew you were gambling and a sure loser. I did not see the house. Your friend had arranged a loan for you”, explained the property consultant. One of the great values inherent in that tryst was the commitment to democracy which, uniquely, was adopted as an instrument rather than an end product of popular upliftment and social and economic change. Today it is India’s proud boast that it is the world’s largest democracy. That is numerically true. Repeated elections, each a wonder in itself, have established a tradition of parliamentary democracy that has permitted debate, dialogue across the country’s extraordinary plurality and facilitated peaceful and orderly change of governments. A few years ago, when a terrorist attack was mounted on Parliament House, it was rightly argued that that this was not just another brutal incident, but an assault on India’s democratic ethos and political leadership. Whatever the intention, the attack failed. Sadly, however, some of India’s own parliamentarians, howsoever inadvertently, have come close to achieving what the terrorists tried in vain to accomplish. The current monsoon session of Parliament saw a by now familiar spectacle of pandemonium, with even senior members invading the well of the House, compelling the presiding officers to suspend proceedings for the day. The occasions were trivial, as all that the Speaker and Chairman sought was the orderly conduct of business in accordance with established rules and conventions without any intent to muzzle legitimate debate. Bedlam prevailed, defeating the very purpose of parliamentary discussion. Unfortunately, both sides of the House have been guilty of unconscionable behaviour at various times. Those witness to these ugly scenes from the visitor’s gallery or who watch the proceedings on television and read newspapers must increasingly fear a continuing erosion of parliamentary credibility to a point when the country will cease to take Parliament seriously. Sadly, senior parliamentarians, including ranking party members, have actually led the charge. Why? To score what are utterly petty, partisan points out of wholly self-regarding motives. It was sadder still to see the BJP mindlessly turn on the Speaker and accuse him with bias despite his best efforts to rise above party and ideological considerations and conduct the proceedings fairly and impartially. Fatuous political leadership can command little respect. The Speaker has on occasion ordered that the official television camera in the House be switched off to spare Parliament the shame of indecent exposure. But this does not always happen and the channels and newspapers have pandered to sensation by playing up such scenes with a prominence they simply do not merit, inviting popular contempt. Such disruption precludes discussion of matters of great national importance and interest, year after year. The report of the National Minorities Commission has not even been tabled in Parliament, along with the government’s mandatory action taken report, for almost ten years! That of the Commissioner for Scheduled Tribes is three years behind schedule. Yet Parliament is singularly unconcerned. What message does this send. If legitimate systems are blocked, people will turn to illegitimate avenues of expression and grievance reddressal. The Naxalite problem has been spawned by decades of masterly inactivity by the executive and legislative branches of government. The writing is on the wall and parliamentarians and parties must take note before it is too late. Yet there is another side to the story. The Museum of Parliament inaugurated on the eve of Independence Day reminds us of the many great men and women who have served Parliament and the nation with dedication and distinction and of famous parliamentary occasions. These are traditions that will continue to inspire generations to come. The decision of the Lok Sabha Speaker to fund an independent Parliament TV channel is greatly to be welcomed. This should focus on the many serious debates and thoughtful speeches made by members, including backbenchers, on a variety of legislative and other topics during the generally unreported discussions that follow zero hour when the House and the press gallery empty out. Coverage of such events could impart a new relevance and dignity to Parliament and bring kudos to members who engage in constructive debate. Apart from legislative business, Parliament needs to have more free-wheeling debates on current issues — agriculture, the urban crisis, population, water management, the roots of Naxalism, foreign affairs, security issues, Defence, et al. It would be instructive to hear from Members how the national rural employment guarantee or right to information regimes are working and so forth. Parliamentary committees too could take expert evidence on key issues as a means of improving legislation or formulating policy. The list could go on. At present the verdict of an old parliamentary reporter is that Parliament is functioning well below its potential. IN Punjab and much of north India the farming community is slowly but surely losing hope and direction in keeping agriculture alive as a means of livelihood and a respected way of life. Neither the Reliance farm retail pact or the periodic bugle-blowing by the Punjab Congress or the Akalis can wish away or fool the people as to the pathetic state that the average farmer today finds himself in. Nearly 37 years after the Green Revolution, farmer suicides have risen but water table has dropped, crop yields are stagnant, but farming costs have gone up with diesel and fertilisers getting more expensive, and land holdings have dwindled away, leading to migration of the youth to the cities in search of jobs. Shorn of party politics and electoral sparring in the days ahead, it is time that the bogey of ‘all is well with the farmers’ is brought under public gaze and debate. The tubewells lie silent because there is very little electricity in many of the villages, both by day or night. If a trickle of electricity is provided around midnight or in the very early part of dawn to the tubewells, it is never ever appreciated that a fatigued farmer is hardly in a position to water his fields fully and effectively in the limited time available. The policy of providing free electricity to the rural base has boomeranged many a time. The average farmer would rather pay his bill in return for assured supply, than have a state of affairs where government washes its hands off timely maintenance and repair of the existing infrastructure. Switching over from wheat and paddy cultivation to other crops under the much hyped diversification scheme is another bogey, unless in the interim decade or two atleast(when the farmer switches over) government support, especially to the marginal farmer with very small holdings is ensured. What our town babus sitting in the offices do not seem to understand is that the farmer is running on a credit card economy where he has already spent on daily upkeep and loans for seeds and fertilisers and for crops that are yet to be sown and harvested. Today, second hand tractors lie in mandis and market places up for sale so that a farmer may repay his debts, but there are no buyers even at throw away prices. The other essential for agriculture, water, is also in short supply because of lack of power, and the diesel pumps and motors have become cost prohibitive. Sadly the priority all the time is the next election, and this goes for most, irrespective of party affiliation or personality. Many of our agriculture experts too are often found wanting in giving the correct advice to the political masters, as soon as they start heading some government committee or organisation. Otherwise I fear that the day will come when out of sheer desperation the farmers of the region will stop production of any kind and take to the streets in violent protest. 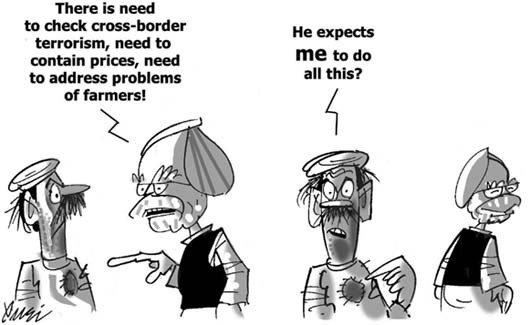 The economist in Dr Manmohan Singh would surely note that the farmer here is as badly off as his counter part in Vidharba or elsewhere in the country, and needs to be bailed out expeditiously with a fully functional and transparent support mechanism. THE suicides in the farm sector are not confined to grains and pulses alone as hundreds of workers in tea plantations have also ended their lives for non-payment of wages for years. The Supreme Court was informed of this by a private organisation — International Union of Food Agriculture — which moved a PIL on the plight of tea industry workers. A Bench, headed by Chief Justice Y K Sabharwal, though, was of the view that the remedy for the workers lies with the labour courts in nine states having tea plantations. Yet, it admitted the petition after senior advocate Colin Gonsalves, taking up their cause, argued that tea boards in many of states had virtually become defunct. Rolling out the details about the plight of workers in tea plantations, he said Rs 366 million alone were due to nearly 17,000 workers in West Bengal. The condition was the same in Assam, Kerala, Tamil Nadu, Himachal Pradesh, Tripura, Karnataka and Uttranchal. The Court issued notices to the Union Government, Employees Provident Fund Organisation of India, governments of all the nine states and tea boards set up by them, seeking their replies. In view of the high litigation cost, specially with regard to the fee charged by lawyers, the Apex Court Middle Income Group Legal Aid Society has come out with a proposal to provide the services of senior advocates as well as Advocates-on-Record at a reasonable fee. This comes as a major relief to the middle income group, as in the Supreme Court, the cases are only registered through Advocates-on-Record to ensure that the rules relating to filing a case were properly followed. The information regarding the procedure for engaging an advocate for reasonable fee could be obtained from the Supreme Court Middle Income Group Legal Aid Society. This scheme is separate from the National Legal Services Authority (NALSA) meant for poor people, free of cost. With the Government taking some positive steps regarding speeding up the selection process of high court judges, the number of vacancies in different high courts have come down slightly during the past six months. But with the retirement of more judges in subordinate courts, the number of vacancies there have increased during this period. As per the official figures released by the Supreme Court recently, the number of vacancies in 19 high courts stood at 141 as on July 24 as compared to 154 in January. The vacancies in lower judiciary have gone up to 2,860 as compared to 2,730 during the six-month period. Patna High Court topped the list with 19 vacancies, followed by high courts of Punjab and Haryana (14), Allahabad (13), Madras and Andhra Pradesh (11 each) and Gauhati (10). The vacancies in other high courts were between 3 and 7. The high courts of Sikkim and Chhattisgarh were the only ones having no vacancies. The sanctioned strength of high court judges in the country is 726 of which only 585 are filled up. A symbol of stark simplicity and down-to-earth common sense, Mr Kamaraj was in many ways a unique personality who attained great eminence without seeking it. For some years he was the most powerful individual in Indian politics. Singularly faultless in personal life, he was firm as a rock as an administrator and also in the political game. But he loved the masses with unmatched passion, reflecting their urges and voicing their hopes in a manner the country had rarely seen before. His eloquence lay in his general silence, for essentially he was a man of action, not of words. They alone have love for God who bear his fear in their minds. This is the abode of love not the house of an aunt. Only the one who has relinquished all pride can enter here. (And the truthful men and the truthful women....) Allah has prepared for them forgiveness and a mighty reward.